Adventure. Travel. Wine. Photos. Food. Paris. Books. Cooking. Caftans. Cocktails. Romance. Macarons and Mayhem. The Beast and I decided to have a Treat Yo’Self Thursday last night, so we decided to check out the new Treat ice cream parlour in downtown Raleigh. How cute is this hipstery-y sign complete with doggy water? Not trusting the idea of tethering my beast to a chair or pole, the game plan was to yell my order through the door and toss some stranger my credit card. However, the youngsters working the counter told me just to bring my panting, drooling long-hair dog into the place. Health code violation? Doubtful. We selected our flavors. I went with “Carolina crunch” which was vanilla with bits of Heath Bar and caramel and cookies and cream. The scoops were miniscule so I didn’t feel badly about needing to try two flavors. 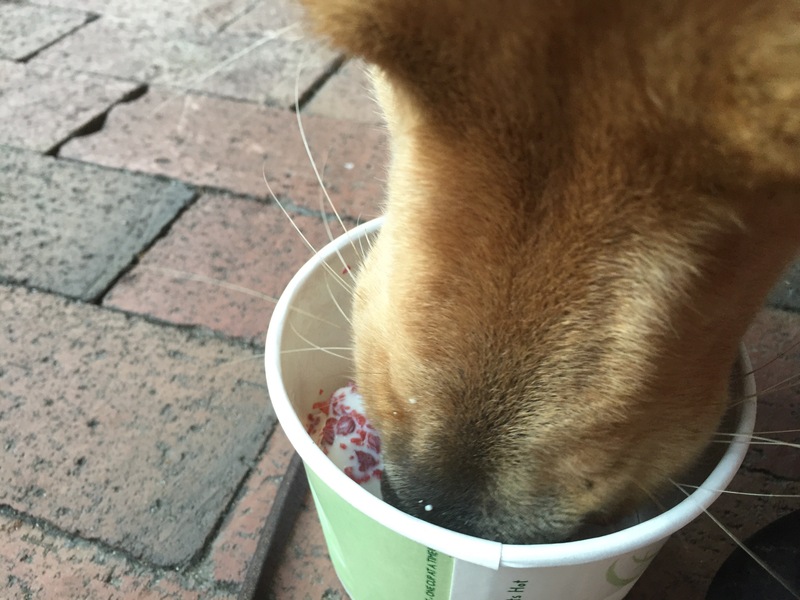 The Beast selected a “pup cup.” At a cool $6.50, he received three (mini) scoops of vanilla ice cream covered in bacon bits. It was supposed to come with a Milk Bone sidecar to act as a cone, but did not. I was so busy making sure he dind’t jump on other patrons, I just let it go. Though at that price, I should have insisted on the bone. My ice cream was basically a waste of calories. The Carolina Crunch was nice if I hit a big patch of crunch, but otherwise was basically vanilla ice cream. The Cookies and Cream, an all time favorite, lacked, well, cookies. It was basically chocolate ice cream (I hate chocolate ice cream). There were no big soft chunks of Oreo to chomp through; I was most disappointed and threw out half of the whole dish. The dog on the other hand, was ecstatic. I set both bowls on a bench and he knew one was for him. I have no idea how as he had never had a bite of ice cream before this moment. It was more satisfying watching him carefully devour the treat. He moved it from the bench, to the ground, paws, no paws, and finally, I held it in between my flip flops for him so it wouldn’t move about. Adorable and he finished every last lick. 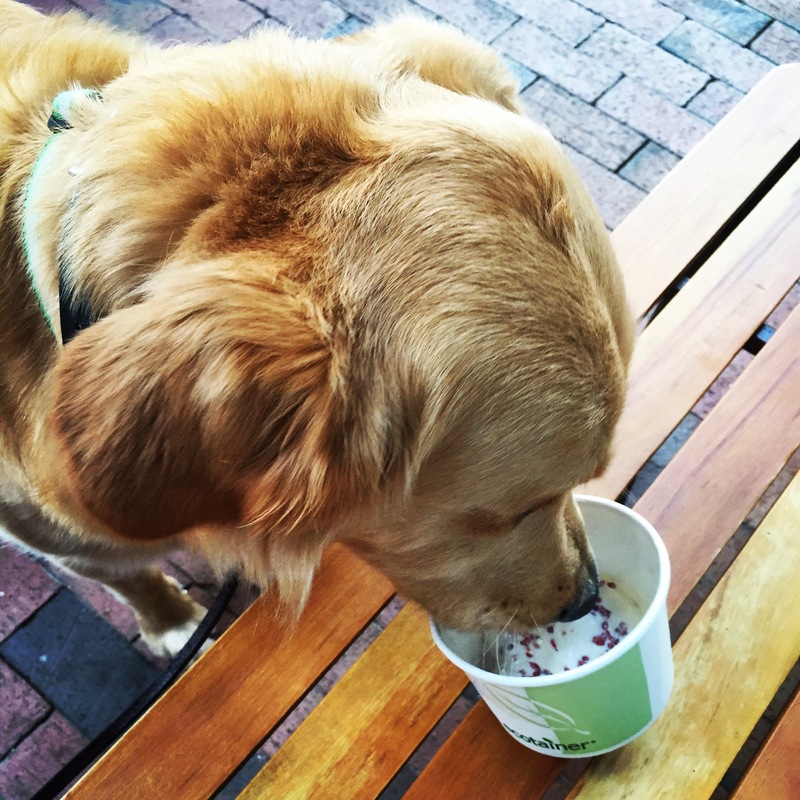 I’m not sure I need to return to Treat for treats.They don’t even make their lackluster ice cream. The dog experience was fun, but was just too expensive to miss a Milk Bone. Half-hearted try, guys. We’ll look for our Treats elsewhere.